How do I take my writing and reading instruction to the next level? Join us and veteran teachers Leila Christenbury and Ken Lindblom in answering this question in an event that will advance your practice and transform your classroom! NCTE’s Summer Institute is informed by more than 70 years of combined classroom experience, a large body of research in the discipline, and the collective expertise of a broad network of English educators. Build a lasting professional network to strengthen your efforts (and sense of humor) as you walk this continuing journey called teaching English. 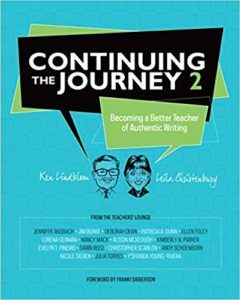 All participants will take home a copy of Continuing the Journey: Becoming a Better Teacher of Authentic Writing, Continuing the Journey: Becoming a Better Teacher of Literature and Informational Texts, a comprehensive presenter handout packet, and a personalized certificate of attendance for 15 CPUs. Read a sample chapter from the second book in the Continuing the Journey series. Teaching English well has always required bravery. To be relevant, teaching English today requires different skills than it did even just five years ago, skills that are critical to our students’ informed participation in society. A literate population depends on the work we do and how well we do it within the changing landscapes in which we work. More now than ever, the wisdom and insight of veteran teachers is crucial to our ongoing, effective classroom instruction. Engage with new media, a central facet of teaching critical literacy. Help students to apply ethical and critical thinking to the tools they use for composition. Broaden the genres, types, and intended audiences for which your students learn to write. These are hard, but necessary, things we as veteran teachers must do. This Institute will teach you how. Both Ken and Leila are veteran English teachers who are passionate about staying current with their teaching skills and helping other teachers improve their practices. They have successfully collaborated for some years on a number of projects and bring, between them, both a shared commitment to teaching excellence and different perspectives on a variety of topics. Leila Christenbury is Commonwealth Professor Emerita at Virginia Commonwealth University, Richmond, where she has taught English methods, young adult literature, applied English linguistics, and the teaching of writing. 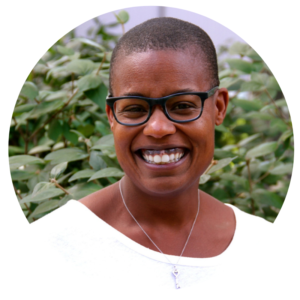 A past president of the National Council of Teachers of English (NCTE) and a past editor of English Journal, her research has been recognized by the David H. Russell Award, the James N. Britton Award, and the Edward B. Fry Book Award. An active member of NCTE for more than 40 years, she has taught in Virginia high schools and universities for most of her career. In his thirtieth year as a teacher, Ken Lindblom is Professor of English at Stony Brook University, where he teaches courses in English teacher education and rhetoric. A member of NCTE since 1989 (when he taught high school English in upstate New York), Ken was editor of English Journal from 2008 through 2013. He is coauthor of four books about teaching English and more than two dozen articles, book chapters, and peer-reviewed blog posts on the subject. If you are a veteran English teacher, beyond the first-year jitters and ready to focus fully on the success of your students and your own professional growth, this Institute is for you. If you’re a mentor, senior colleague, department chair, or school leader who supports teachers in their first 10 years in the classroom, thank you! You are so important to helping them continue the journey. In this institute you’ll learn new ways to strengthen your role in that work. What will the Institute be like? What's the schedule? Explorations of new approaches to reading and writing. One credit will be available through San Diego State University. An additional written assignment and fee will be required. More details coming soon. The Biltmore Hotel is offering a very reduced room rate ($139 per night) to Institute attendees. Each room has two king-sized beds, as well as a nicely appointed sitting area. Visit www.providencebiltmore.com, click on the “Book Now” button in the top right corner of the screen, choose your arrival and departure dates and enter the group code 1906NCTE19. Rooms in our block will be held until May 30, 2019. 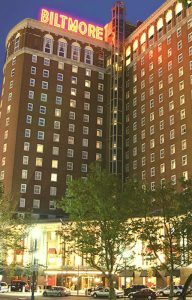 Guests can call a Hotel Reservations Agent directly at 401-340-2974 seven days a week, twenty-four hours a day, and use the group code 1906NCTE19 when speaking with the reservations agent.